Welcome to Lawnswood School and Ralph Thoresby School Sixth Form Partnership. We are delighted that you are considering joining us for the next stage of your education and hope you are able to find all the information, on our website and in our prospectus, that will help you make a decision about what to study and how we can support you. 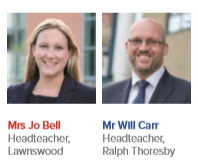 Our partnership is well established with both sixth form leadership teams working collaboratively to ensure the individual needs of students are met. Together we offer a broad, balanced and engaging curriculum which takes the best elements from both schools, to create a unique post 16 experience, with a proven record of success. We are very proud of our Sixth Form which offers students the opportunity to study a range of A levels and vocational equivalents in a dynamic and supportive environment. We have an outstanding success rate with 100% of applicants gaining a place at university after studying with us. Over 20% of our students go on to study at prestigious Russell Group universities. Our results are consistently strong with high proportions of students reaching the top grades (and positive value-added performance across both centres). Both schools have also recently been graded ‘Good’ by Ofsted. We are committed to offering a combination of academic challenge and support which will enable you to successfully progress into higher education, employment or further training. Our specialist information, advice and guidance is tailored to suit the needs of each individual and our dedicated team of tutors and mentors work with you to ensure your success. Our academic record reflects high quality teaching in the Sixth Form. Pastoral care is strong across the partnership and effectively supports both academic and personal success. In addition, our broad enrichment programme will ensure you are fully equipped for the next stage of your career. Students relish the opportunity to meet new people and broaden their horizons, while still retaining the support they have grown accustomed to in their ‘home’ school. Students relish the opportunity to meet new people and broaden their horizons, while still retaining the support they have grown accustomed to in their ‘home’ school. Please explore this website, our prospectus, and be sure to join us for our open evening in October to learn about our successful sixth form provision. Should you wish to visit the Sixth Form Partnership, please contact us using the links at the top of the website. It will be a pleasure to show you around and answer any questions you may have.